Estwings popular 11 in. Japanese pattern design Pro-claw nail puller, is made with fine tool steel, drop forged and tempered for extra durability. Chrome finish and comfortable blue cushion grip. Both nail puller claws are precise and sharp to remove imbedded or headless nails with ease and minimal wood damage. Shape and rounded head design gives you improved leverage. Precision thin claw design enables you to get into hard to reach places. For use in nail removal right angled for removing embedded and headless nails. Protect your eyes from flying particles and dust. Always wear safety goggles. Bystanders shall also wear safety goggles. Approximate overall length 11 in. 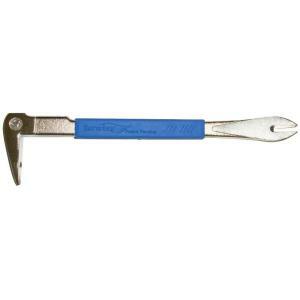 Tbook.com crawls the web to find the best prices and availability on Nail Pullers and related Tools and Hardware products like Estwing 11 inch Pro-Claw Nail Puller with Blue Cushion Grip. For this page, related items include products we find that match the following keywords: "Nail Puller" at our vendor partner Home Depot. Estwing 11 inch Pro-Claw Nail Puller with Blue Cushion Grip is one of 14 Nail Pullers and related products listed in the Tools and Hardware section of Tbook.com If you have any questions on this product, please give us a call at 734-971-1210 during the hours of 9am - 5pm EST for assistance. Thank you for shopping at Tbook.com, the Internet Department Store!